New Mexico was a spur of the moment trip. A friend who had visited a year ago came back with gleaming eyes and charming description of her time there. The excitement was so contagious that a year later, we found ourselves on a plane heading for Albuquerque. The green and luscious landscape of the upper Midwest summer gave way to the southwestern landscape of brown sand, rocks and cactus. Adobe homes hinted at an unfamiliar culture that existed in New Mexico, and most buildings were of a brown hue that blended into the desert. The sharp color contrast from Chicago’s scenery was a hard reset for our minds. Day 1 – Arrive to Albuquerque (ABQ) New Mexico – Time to Eat! With our bellies full of corn and Chiles, we headed to the Petroglyph National Monument. To our surprise, we found that the areas dedicated to the monument were scattered right behind people’s homes, and the monument was a completely casual affair with few signs for where to go and what to look for. We walked around any path we could find, scrambled up rocks, dodging lizards, feeling like explorers on an archaeological mission. We did spot a good number of petroglyphs, which were ancient carvings of mostly human and animals on the rocks. And then we found ourselves scorched by the sun and were forced to seek shelter. Clearly, we were not used to the sunlight that New Mexico seemed to have an abundance of. Sandia Peak – Take a Flight On the Longest Tram in the U.S. The next stop was Sandia Mountain, located just east of Albuquerque. We had initially planned to hike up the mountain, but the sun and our filling lunch wore those ambitions away, so we took the tram instead. The tram was reputedly the longest in the US, and the ride turned out to be a quite a fun experience in itself with some great views. As we zipped up the mountain, the tram operator described the geological landmarks, calling out the canyons and waterfalls that we would have otherwise missed trekking on the ground. The tram ride also made clear how tough the hike would have been by giving us occasional glimpses of a steep and narrow path zigzagging upwards. One thing we knew for sure, the tram ride guaranteed that we would make it to the peak. The peak of Sandia sat at an altitude of 10,378’ with noticeably cooler air and exhilarating views. If you stood at the right spot, you could see Santa Fe in the far distant and Albuquerque on the other side. The views were unobstructed and expansive with mountains even taller than Sandia abound in the surroundings. Hiking along the crest, we headed towards Kiwanis Cabin, which was built as a refuge for long distance hikers. Although, according to the tram operator, the stone cabin had to be rebuilt a number of times because it was so prone to lightning strikes. Safety issues aside, the vista upon arriving at the stone cabin was equally, if not more, breathtaking. Beautiful deep blue sky coupled with seemingly endless desert and mountains. We stood still, breathing in the clean crisp air and soaking in the panorama until a gust of chilly wind hit us and storm clouds appeared. The benefit of being on high ground was the ability to see far ahead, which gave us plenty of time to head back towards the tram before the drenching rain came. The hike on Sandia was surprisingly easy for the altitude, and came with plenty of scenic views. We are avid hikers but not athletes, so in our humble opinion, hikes that were relatively easy on the body and rewarding for the mind offered the best value. We spent the next morning leisurely strolling in the Old Town neighborhood of Albuquerque. Old Town was centered around a plaza, with San Felipe De Neri Church on one side, and a ring of charming adobe shops on the other sides. We were told that locals avoided this area due to some tourist-trap characteristics, but as outsiders, the historical San Felipe De Neri Church was still worthy of visiting. The Church was quiet that day, with a few tourists in the front yard snapping photos, and a few venturing inside. A lively melody drifted over from the plaza, and we followed the music to find an ensemble of men and women playing harps and various guitars, and singing in Spanish. A small group of people had gathered around the band, clapping to the lovely cheerful music. Check out the video! We wandered around the shops and found some charming alleyways with delightful little shops on both sides. The shops included some small galleries with intriguing and affordable local art, niche boutique stores selling local honey, handmade soaps and other curiously curated collections of wares. Tent Rocks was a national monument with unique conical rock formations. We saw pictures online that piqued our curiosity, and right away, we knew we had to hike the trails no matter how tough it was going to be. Tent Rocks was also conveniently located between Albuquerque and Santa Fe, making it a good detour as we headed towards Santa Fe. At the entrance to Tent Rocks. The trail winding through the brush on the way up. The trail started off on flat and dry sandy ground, but it soon turned into massive rock walls on both sides, technically described as a slot canyon. Parched-looking trees with gnarled roots attempted to trip us as we navigated the canyon. We squeezed through tight sections of the slot canyon and scrambled over large rocks in our path. The views in front of us seem to magically morph with each step forward, culminating at the summit with vistas that were literally heart stopping. At the summit, we could see the tops of the strange conical rocks, juxtaposed with desert land as far as the eye could see. The view that had inspired us to visit was right in front of us, but more vivid, and with much more depth, breadth, color and even a palpable sense of danger that we would step slightly off the path and slide down into the canyon below. The scenery was absolutely phenomenal. And, the hike was surprisingly manageable to boot. The elderly who completed the hike could attest to that. In the slot canyon a human can barely fit in between the carved rocks. View up the expanse of carved rocks in the Slot Canyon of Tent Rocks NM. A little size comparison… It may be slighty distored from my wide angle lens, but it’s an imposing atmosphere. With the sun setting, we hiked back down to the slot canyon and back to the open desert. Along the short loop path at the base of the canyon, there were a number of smaller conical rocks that jutted out here and there, and even an ancient man made cave that had probably sheltered a few people in its heyday. Tent Rocks was a lot more majestic and surreal than the pictures that brought us there. It was certainly well worth the detour to visit. Ghost Ranch was located in Abiquiu, and was owned by the Presbyterian Church who ran it as an education and retreat center. We had chanced upon this obscure place while looking into popular hiking trails in the state. Interestingly, Georgia O’Keefe had lived here, and the beautiful layered rocky canyon had inspired and influenced her art. There was barely anyone around when we arrived at the ranch, and it appeared mostly deserted, if not abandoned. We found the office to register ourselves, grabbed a map, and started off on the Chimney Rock hiking trail. We soon found ourselves completely alone, the ranch far behind us. The hike was strangely quiet, except for the sound of our footsteps as we put one foot after another, slowly ascending the steep hill. As we trudged forward, a massive cliff face loomed in front of us, and it felt so close as though we could touch it with our hands outstretched. But, in between us was an abyss, made dark and intimidating by the cliffs that closed in around it. Our voices echoed as we hollered. Uncontrollably, the fear of slipping and falling circulated in our minds as we clambered upwards on a ledge. Thankfully, the trail flattened out to a path on the ridge of a hill, providing beautiful views in all directions. 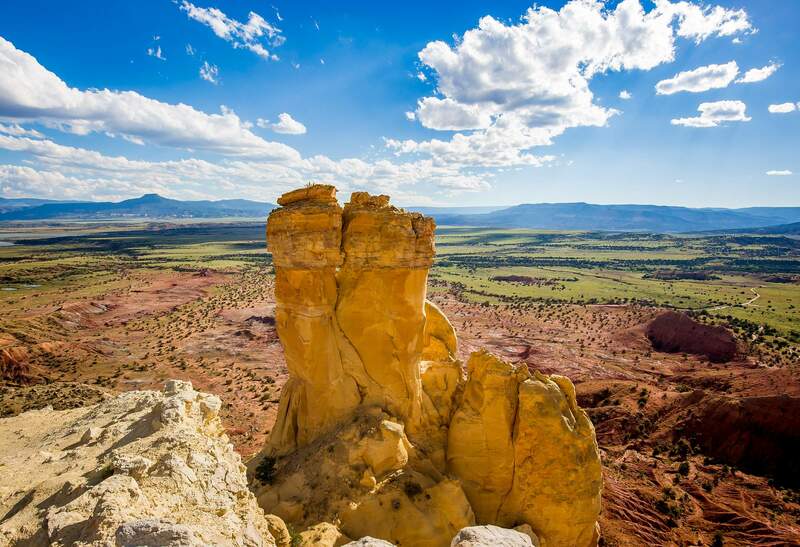 The trail ended as the hill dropped off into a vertical cliff, and right across, was the aptly named Chimney Rocks, which jutted out against a backdrop of desert and hills with azure sky. We headed back the way we came, and magically, the view in the opposite direction was different but just as beautiful. The same abyss that had unnerved us was now a friendly gorge where we took a break by the ledge and threw rocks into. Maybe the light changed our perspectives, or maybe our minds were playing tricks on us, but it was as though we were hiking a different path back to the ranch. With an hour left to sunset, we picked a shorter hike, which led us by some abandoned shacks before ending at a wall of plaques that stood in front of a butte that rose majestically. 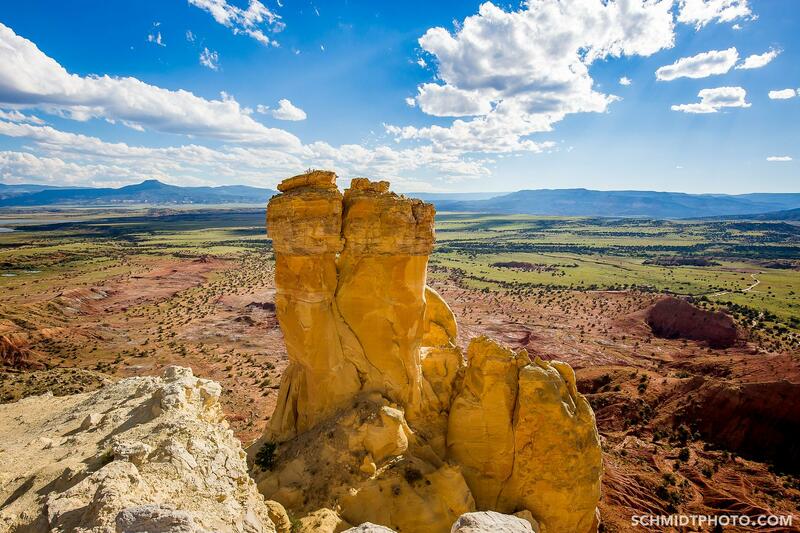 The memorial was dedicated to people who loved Ghost Ranch and who had passed. Animals were welcomed too, as evidenced by a cracked urn with a paw print that sat on top of the wall, long emptied of its contents. Eerie silence enveloped us. As the sun began to set, we strolled back to the ranch, passing more mesas and butte, and hikes that we were not able to embark on this trip. The ranch had come to life a little. Two children were climbing up small trees picking apples, some were sitting on benches in the middle of an open field, gazing out towards the hills, and others were walking around leisurely. The experience at Ghost Ranch was hard to describe. 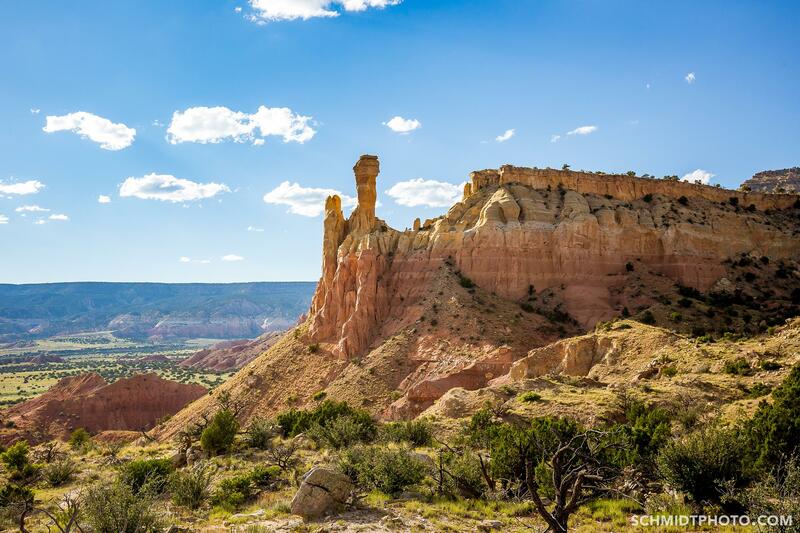 The ranch and canyons were starkly silent, devoid of almost any other sensory stimulation besides the vividly colored layered rocks with different hues of red, and the deep blue sky. The cliffs felt so close, yet so untouchable. The peace that came with being alone, the mind focused only on putting one foot in front of the other, and the physical sensation of sand and rocks crunching beneath the feet, and heart pumping in the chest. We felt emotions as diverse as exhilaration and deep fear simultaneously, feelings so complex and mysterious for words. The rawness and beauty of the landscape could only be best experienced by being there. Santa Fe is the capital of New Mexico. At 7,198′, it is at a higher altitude than Albuquerque, and is the highest capital city in the US. 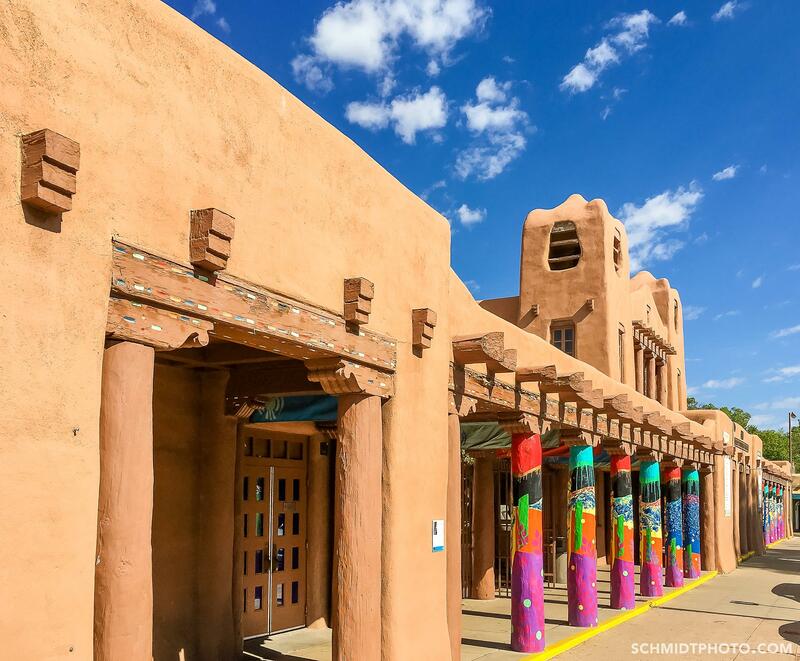 Recent travel literature on Santa Fe had been pretty negative, with grumbles about the high concentration of retirees from all over that made the city a staid place for the young, and the authentic cultural experience that had since turned into a kitschy tourist destination. But was that true? We were going to find out for ourselves. We headed straight to the well-known Santa Fe Plaza. Right on one end of the Plaza was the iconic Cathedral Basilica of St. Francis of Assisi. The other side of the plaza was the equally iconic Palace of the Governors where Native Americans sat displaying their wares by the sidewalk. Both these places made up the majority of photos that one could find on Santa Fe. Coincidentally, it was also the day of the arts and crafts market. A large number of booths were set up in the Plaza, with artists selling everything from gigantic garden accessories to honey to jewelry. 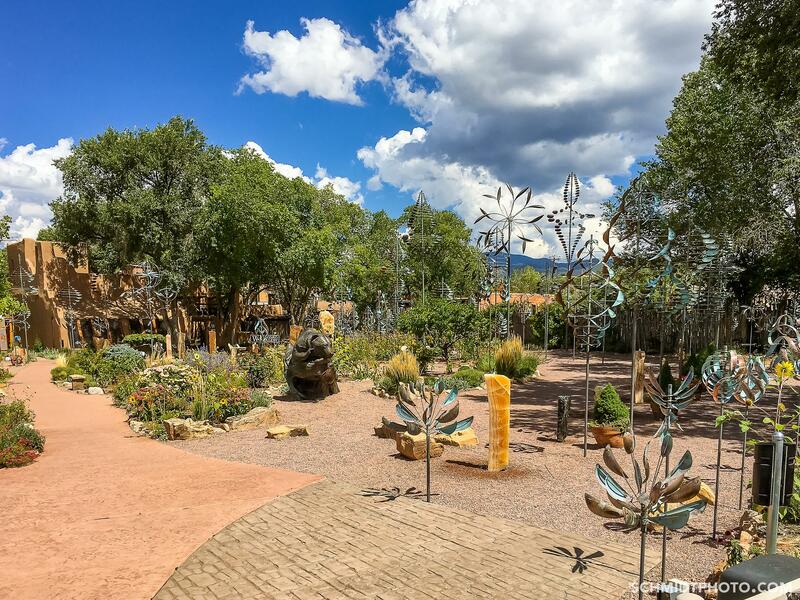 Having been around art fairs in the Midwest, where such fairs were on a much smaller scale with a much smaller variety of art, the Santa Fe art market was really a breath of fresh air for us. We wandered around, sampling New Mexico honey from a friendly person who called everyone “Amigo,” we played with large metal animal-like statues, and browsed the various potteries and paintings on display. Around the plaza, there were shops selling the usual tourist trinkets, but there were also a few intriguing stores that had fossils, custom handmade hats, products completely made of recycled cork, and countless jewelry stores. Heading east of the plaza, we ventured down Canyon Road, known for the fine art galleries that lined the streets. The galleries were situated in historical pueblo homes that had been retrofitted with museum-like white walls, crisp white light, and plenty of wall space for paintings. Some of the outdoor spaces displayed massive sculptures and statues. There was never a day without some form of hiking on our trip. We headed to Hyde Memorial State Park, 15 minutes drive from the Plaza, and jumped on the Circle Trail. It was a short three-mile hike that looped back to where we started, but it was not a hike for the unprepared. The hike warmly welcomed us with an extremely steep 1000’ increase in altitude in a short one mile, which meant we were walking upwards at what felt like a 45 degree incline. Huffing and puffing, we took many short breaks throughout the first mile. Wherever we stopped, we got peeks of Santa Fe through the trees. We breathed a sigh of relief as the hill finally flattened out at the peak, and found a bench to catch our breaths. As we gazed at the endless rolling hills ahead of us, it dawned on us that we would be faced with a steep 1000’ decline in altitude in a short one mile to get back to where we started. Sure enough, the easy flattened path ended, and began a precipitous descent back. We were gripping onto tree branches, trying to stop ourselves from slipping and landing on our behinds as little rocks rolled beneath our feet. The hike was certainly an amazingly intense workout for such a short distance. 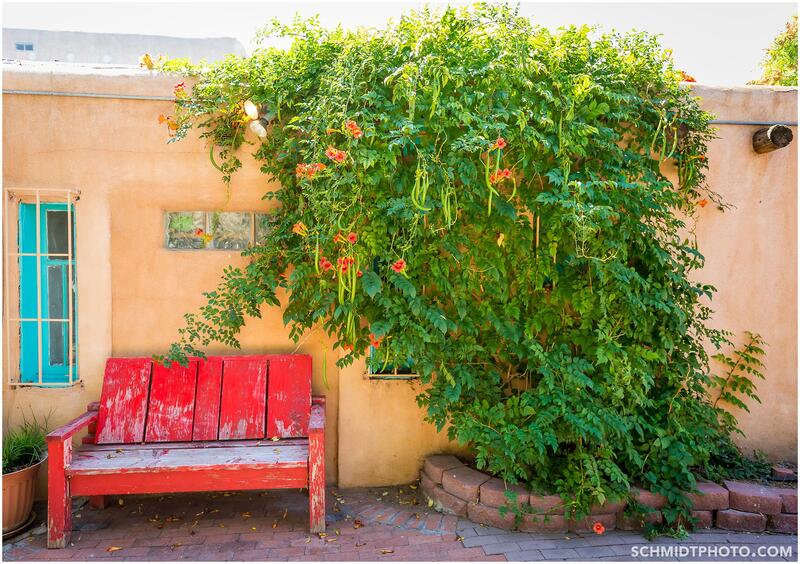 We didn’t think Santa Fe was that kitschy of a tourist destination. Yes, there were many retirees, and the population seemed to be on the older end. But for us, the different landscape and culture was intriguing and eye opening. Perhaps it was mostly because we were not exposed to the Southwestern culture, but we certainly had a great time learning about it. On our last day in Santa Fe, excitement seemed to have left the city. Everywhere was quiet. The Plaza, where the Art and Craft market was the day before, was empty and no one was around. Overnight, Santa Fe had turned into an ordinary small town. The comment, along with the lifelessness of the cities, highlighted a sliver of reality of everyday life in New Mexico – the poverty, the decrepitude and the lack of magic from the locals’ perspectives. New Mexico was after all, one of the poorest states in the US. The fleeting scenes of Native American reservations and pueblos, some with kilns in the yards most likely for making potteries that tourists happily lugged home. But mostly, the barrenness of the homes that hinted at possible struggles the dwellers were facing. Not to forget, the Native Americans who sat near the plazas of Santa Fe and Albuquerque and even Bandelier National Monument, silently watching tourists examining their wares. What was happening in their lives? Despite all that, New Mexico was an intensely beautiful place. We had wonderful memories of the hikes, the breathtaking landscape and of the many friendly people we came across. We could not bear to say bye to New Mexico, constantly staring out of the plane windows to look at the mountains and desert. The view on the flight back was also ruggedly picturesque. Harsh, dry mountains, some dusted with snow, and remote small towns with barely any visible road that led to them. Slowly, the brown landscape gave way to farmlands, and then to bigger towns, and finally Chicago appeared. Back at home, our eyes were glowing, and our minds rejuvenated. We couldn’t help but talk about the trip with such enthusiasm that perhaps, we could inspire someone else to take a spur of the moment trip to this enchanted high desert in the mountains.